Whenever I feel busy or overwhelmed there is one thing I always think about to help me put things in perspective - moms in college. I've never been a mom but I have been a nanny, which I know is just a blip compared to what it actually means to be a full time mom. I also know what it is to be a college student, and it's so hard to imagine balancing both. Yet I've met so many incredible moms who remind me that the old adage is true - "when you want something done, ask a busy person." Moms in college also prove that people have an amazing ability to overcome obstacles when they really want something. However, that doesn't mean it's easy. Being a mom in college is really, really hard. But it's not impossible, and one community college mom Dianna Blake is inspiring other moms to reach their dreams with her new blog College Success for Moms. Dianna is a community college graduate and currently at California State University, Fullerton. She'll graduate in 2015 with a Bachelors in English and Public Relations and plans to pursue graduate school right away. Below is an interview with Dianna so you can learn more about her journey. Please share her incredible blog with any moms you know who are going back to college or who wish they could. It is possible. 1) What inspired you to go to college? My children. They believe in me without reserve, and knowing that their future is molded by my choices really keeps me going. I first went to school at 22 but dropped out, then started part-time in 2007 and finally became a full-time student in 2011. At the time I became full-time they were 9, 4 and 1 year old. 2) What was the hardest part about being a mom in college? Missing my children. I think about them all the time and worry when I am away. I don’t want to miss anything. But I want to say that when I spend time with my kids, my oldest son always says things like “Mommy, I want to go to school just like you” or when I graduated he said, “I am so proud that you are my mom.” That right there is all the reminder I need that I am making the right choices! 3) What inspired you to start college success for moms? My school friends really inspired me to start the blog – especially Anita who has faced so much adversity but has remained resilient and kept moving forward. I realized that there have to be more moms than just the ones I know who are seeking advice, encouragement and motivation. I want to be there for them just as my friends and mentor have been there for me. 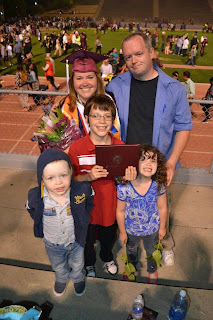 It was during my fall 2011 semester that I realized I am more than a mom – that I was still free to fulfill my goals and aspirations; I want other moms to know that too. 4) What is one thing you wished someone would have told you before you started college as a mom? I wish someone would have told me that there are programs for non-traditional students on pretty much every campus. I discovered a bit too late! It would have been nice to have joined the programs and had that extra assistance/counseling. 5) What is the most important piece of advice you would give a mom in college right now who's struggling to balance it all? Buy a school planner or download an app on your phone. Organization, time management and avoiding procrastination are essential for any student but even more so for moms. Be sure to check out College Success For Moms!